Stay at 5* Centara Grand Beach Resort, PHUKET from ONLY $899*pp! Drawing its design theme from the classic Sino-Portuguese architecture that characterises Phuket Town, Centara Grand Beach Resort Phuket is set directly on the sands at Karon Beach, backed by a green hill, and grouped around its own water park. The resort offers a memorable holiday experience for everyone: couples and families will love the exhilarating leisure activities, the water sports and of course the water park. The accommodation offers a comforting and relaxing ambience for all, and for guests preferring seclusion, the villas provide exclusivity along with great views, and come with the Club category benefits. The award-winning spa, SPA Cenvaree, is a luxurious treat that everyone will enjoy, and has suites for singles and couples. The drive to and from Phuket International Airport is easy and convenient, and takes less than one hour by road. *Terms & Conditions: Prices are per person based on twin share accommodation with return airport transfers and accommodation as specified. Valid for travel 01 Oct – 30 Nov 18 & 01 May - 31 Oct 19. Seasonal surcharges apply 01 Oct – 30 Nov 18. On sale from to 07 Sep 18. Limited availability over school holidays and peak periods. 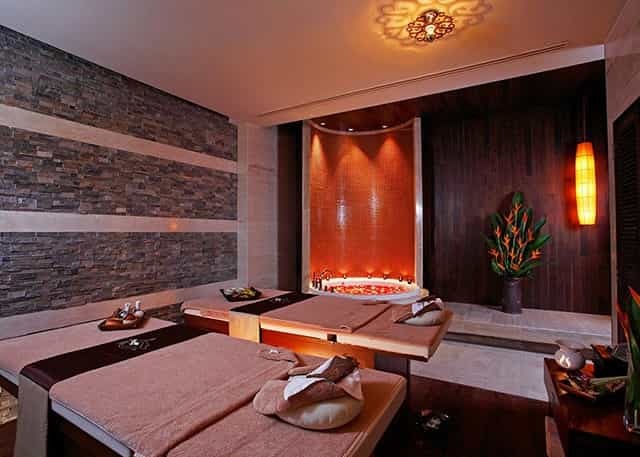 *Lets Relax Massage voucher is valid for the first 200 adults to book at 8 night holiday package. All prices are subject to availability and currency fluctuations and can change without notice. Cancellation and change fees will apply. Booking may be subject to compulsory credit card fees and service charges. Other conditions apply. Contact us for further details.